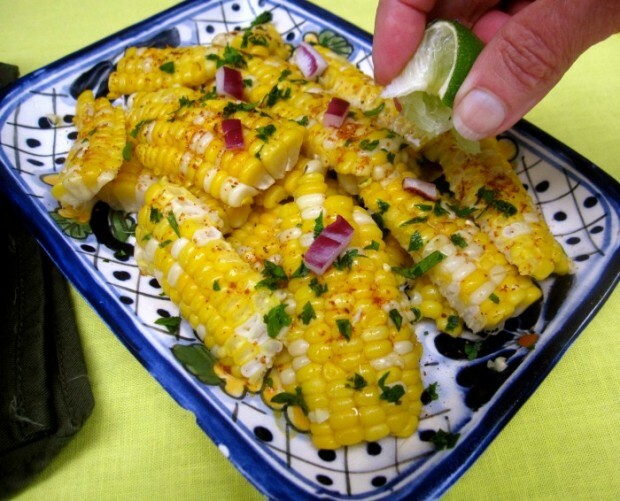 My favorite way of eating corn is when I insert my knife deeply into the cooked cob, then slide the blade down, so that the corn is removed from the cob in a long sheaths, instead of individual kernels. Sometimes the cob obliges (esp. at this time of the year, when corn is juicy and tender), and sometimes it doesn’t; the kernels rain down in secular pellets. Corn sheaths also make pretty garnishes when resting atop a salad of which corn is an ingredient. I had Southwest seasonings on hand, but use whatever spices you need to use up in your pantry. Boil corn until tender In a big pot of salted water. Drain in a colander, and when cool enough to handle. dig a sharp knife into tip of corn and press down the cob so that the corn comes off in a sheath. Top sheath with butter, if using, and season with kosher salt, freshly ground pepper, butter (if using), seasoning mix, cilantro and red onion. Pass the lime wedges.